Afri’s annual teacher training for secondary school teachers takes place in February 2018. The training is an energetic, creative and informative experience, demonstrating effective ways of bringing global issues into the classroom. The training is led by global education expert Gráinne O’Neill together with Pete Mullineaux, a leader in the field of combining drama and global education, and author of Just A Second! Exploring Global Issues Through Drama and Theatre. “I enjoyed the workshop very much. What was most valuable to me was demonstrating how necessary participative methodologies are in teaching Dev Ed (global education). This is something that I haven’t really explored before and it will be very useful to me in the future.” – Participant in the 2017 Afri Teacher training workshop. 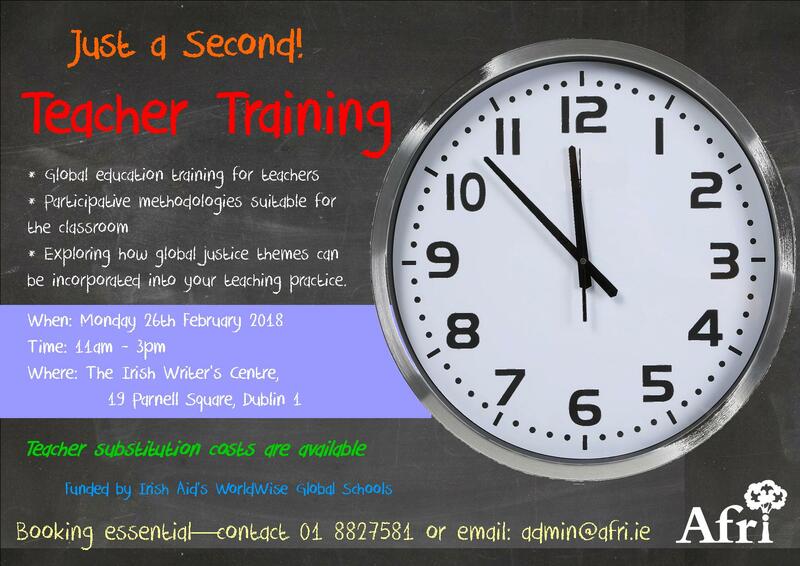 This year’s training takes place in the Writer’s Museum, Parnell Square in the heart of the city on February 26th 2018. Teacher substitution cover is available – be sure to book early to ensure a place on this important training event. Contact Afri at admin@afri.ie or 01 8827563.